I’ve been on a break from my typical dark nails this autumn. There’s a bevy of beautiful new colors out by OPI, Orly, and China Glaze, but I’ve been playing it demure with pale pinks and and occasional mid-toned plum. I got engaged last month and it’s been all about the diamond ring. I’ve named her Juliette. My beau bought her for me and bought himself a Chromebook at the same time, so we named his purchases Chromeo and Juliette. We are dorks like that. This is just further proof that there really is someone out there for everyone, girls! And, yes, I’m pretty sure my Juliette is French, so I tarted up the spelling. But it wouldn’t be Halloween without a fun and flashy color like Chanel Peridot, no matter how much her golden metallic clashes with Juliette. 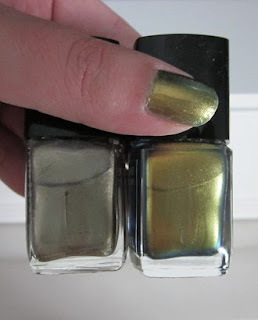 I have to admit that when I hear CHANEL is doing a duochrome or a green, I have to snap it up — sight unseen. They become so rare and hard to find, and I like to encourage the company to keep producing avant-garde colors. Despite the name, this color isn’t the traditional lime green of the August birthstone. It’s got that iridescence that makes it flash yellow, green, and blue depending on the way the light hits it. Nail lacquer lovers refer to these flashy colors as duochromes. The metallic finish is always tricky to apply without showing brushstrokes, but this formula was easy for me to apply in thin coats. It is a big formula improvements from the Chanel polishes released last year, which were thicker and left drag marks along my cuticle line. In the bottle, Peridot shows an acid green hue, which is why I think it is a good choice for Halloween. However, on the nail, it goes on more grellow (a golden yellow with just a hint of green). Disappointing. I wanted a heavier blue flash with Peridot to soothe my cool-toned skin. But if you have a dark, olive, or warm golden skin tone, I think you cold totally rock this with black or olive clothes and the green would really pop in the most fabulous of ways. 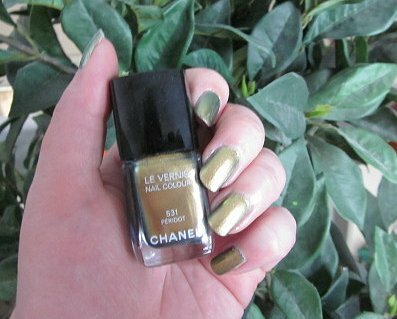 Chanel already has a chameleon polish with Kaleidoscope, which transitions from a golden beige to green, and I think it is better suited to my coloring. Here are some comparison pictures of the two polishes together. What’s your go-to color for Halloween? I lean toward greens and black creme, but OPI Music Hall Curtain Call is a lovely pumpkin foil finished polish. I have been slightly obsessed and enamored with the Chanel show. Everything from the octopus garden set to that Aurora Borealis white sequined jacket that will most likely wind up in the closet of Rachel Zoe. Pearls peppered the model's hair and face. It was a new level of pretty. A new Chanel foundation is arriving in April 2012 called Vitalumiere Aqua Fresh and Hydrating Cream Compact Makeup SPF 15. The rest of the village that created that flawless complexion was Poudre Universelle Libre Natural Finish Loose Powder, Eclat Lumiere Highlighting Face Pen and Correcteur Perfection Long Lasting Concealer. The blush, Glowing Blush Harmony, will be available in January. Just a touch of peach. 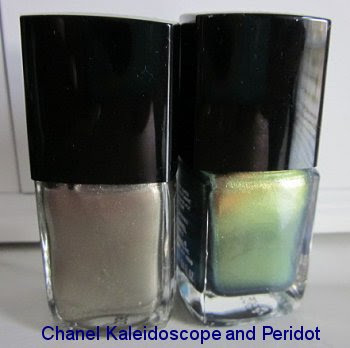 As always...Chanel nail polishes look like a breath of fresh air. June appears to look like a soft apricot shade. A conch shell underbelly could have been the inspiration. Le Vernis Limited Edition Nail Colour in June (available January 2012). The pearly white nail shade featured on some models was created for the runway show. I wish I could find a more detailed shot. Did I detect an aurora borealis vibe? You can see the nail polishes on the blog of Lisa Eldridge. She is a Makeup Artist God and an overall lovely twitter buddy. Follow her on twitter and bookmark her blog.